As Plato once said, “Necessity is the mother of invention”, throughout the history, technical developments have been greatly influenced by the economy as well as social factors. In America in the 19th century, the industrial revolution bore much technical advancement that altered the course of the economic future. It was after the invention of the automobile, the production of natural rubber greatly flourished. The users soon discovered that the natural rubber could be employed for use for a variety of applications in different industries. However, the time of World War 2 presented certain countries with restricted natural rubber resources. As an outcome, the events of World War 2 propelled the discovery, generation and the wide distribution of the synthetic rubber materials. One of the primary artificial elastomers invented was the Styrene Butadiene rubber or SBR rubber. SBR rubber is the commonly used elastomer. If you look at the soles of your shoe or even at the tires of the automobile then you will find that SBR is the typically used material because of its unbending defense against abrasion. The rubber floors that are made from SBR rubber tiles are highly being considered for different commercial applications, especially in the high traffic surroundings. SBR is a synthetic rubber that has no natural rubber content. The SBR rubber tiles are highly recommended for gyms, institutional facilities, garages, workshops and basements for multiple reasons. The SBR rubber tiles are flexible, resilient and durable and resistant to dents and burns and perfect for the ones who suffer from certain allergies. Rubber is impervious to warm underfoot, liquid and is very easy to clean. The SBR rubber tiles permit seamless installation which makes them perfect for the surroundings for resistance to slips on flat and dry surfaces. The resilient surfaces also lower the potential for injury when someone falls down and also minimises back and leg fatigue. The chief benefits of SBR rubber tiles flooring also encompasses stable material, sound absorbance than the usually vinyl flooring, resistance to impact loads, chemical spills and cigarette burns, common maintenance requirement with no waxing requirement, natural resistance to damage from scuffs and gouges because of their homogenous construction, restricted personalized graphic, superior colour uniformity and design options and no health or environmental concerns. The SBR rubber tiles of Amazing floors are available in many colors and styles to suit the design needs. The key consideration includes walking comfortably; safety and hygiene have been incorporated into the rubber flooring during its manufacture by the brand which has also equipped it to offer SBR rubber tiles in variety of colours and specifications that would match your need and requirement. Its manufacturing includes copolymerization of the three parts with one part styrene. The most widely used application is the tires. SBR is the chief raw material of many manufacturers. The SBR rubber tiles that are used in the product of the rubber flooring are second-hand black scrap tire. The scrap is usually cleaned to remove the fiber, metal and many other impurities. In addition to all that, the SBR is the ground to customized sizes for the use in manufacturing. 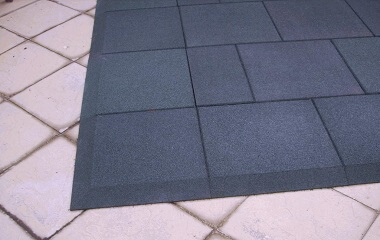 The option of choosing SBR rubber tiles will be the best flooring choice for you!